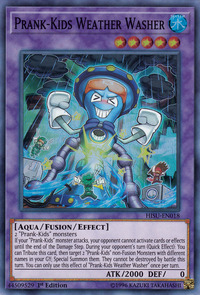 If your “Prank-Kids” monster attacks, your opponent cannot activate cards or effects until the end of the Damage Step. 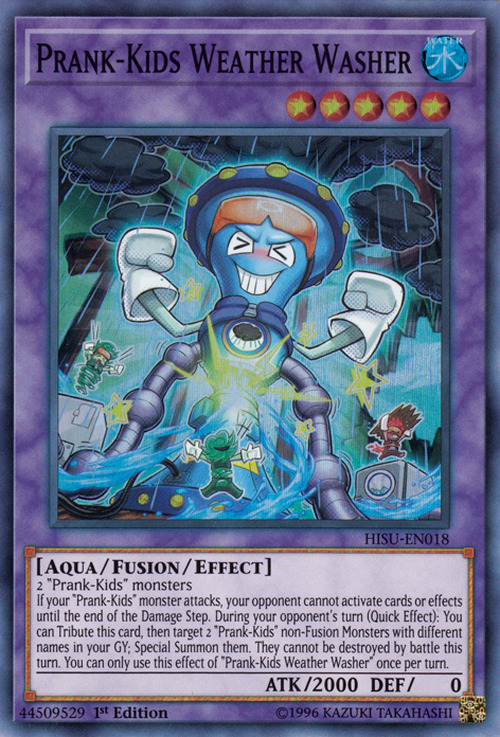 During your opponent's turn (Quick Effect): You can Tribute this card, then target 2 “Prank-Kids” non-Fusion Monsters with different names in your GY; Special Summon them. They cannot be destroyed by battle this turn. You can only use this effect of “Prank-Kids Weather Washer” once per turn. Prank-Kids Lampsies, Prank-Kids Fansies, Prank-Kids Dropsies appears in this card's artwork.